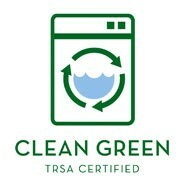 All of our laundry facilities have been awarded the Clean Green Certification by TRSA. The Clean Green Certification is given to companies who practice sustainable methods. Our facilities are highly automated and equipped with energy conserving technology to reduce the amount of resources needed to hygienically clean textiles and to reduce any waste from the process. We are proud to be recognized by the TRSA and applaud their efforts in making our environment cleaner. The TRSA started the Clean Green Certification to recognize companies that demonstrate responsible leadership in sustainability and conservation to protect the environment. The program acknowledges a textile service company’s continuing commitment to improving efficiencies in water and energy conservation and adoption of best management practices for reusing, reclaiming and recycling resources. Certified textile services operations meet quality standards for effectiveness in conserving resources, controlling sewer discharges and otherwise minimizing environmental impact. For more information visit TRSA.